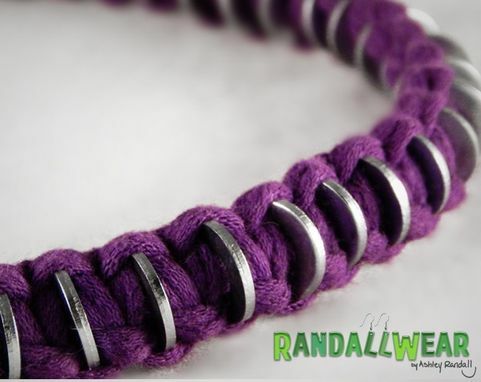 This is a chunky, impressive bracelet and necklace set made from a tee-shirt that was bound for a landfill, and a handful of large hardware store washers. Most materials are upcycled from old objects. It's finished with an over-sized toggle clasp, which makes it really easy to wear. I can do these in any color or length, including alternatives to the standard steel hardware (brass would look lovely, don't you think?). All of the steel washers are bright and shiny. It has a very graceful curve to it, and it's lightweight and comfortable to wear.